Since my buddy Dan was coming up to Los Angeles to referee a football game, I thought this presented the perfect opportunity to introduce him to a restaurant I have frequented since I was a little kid back in the early 1960s. It’s an establishment with a storied history and a good place to blow off a Friday afternoon of work. 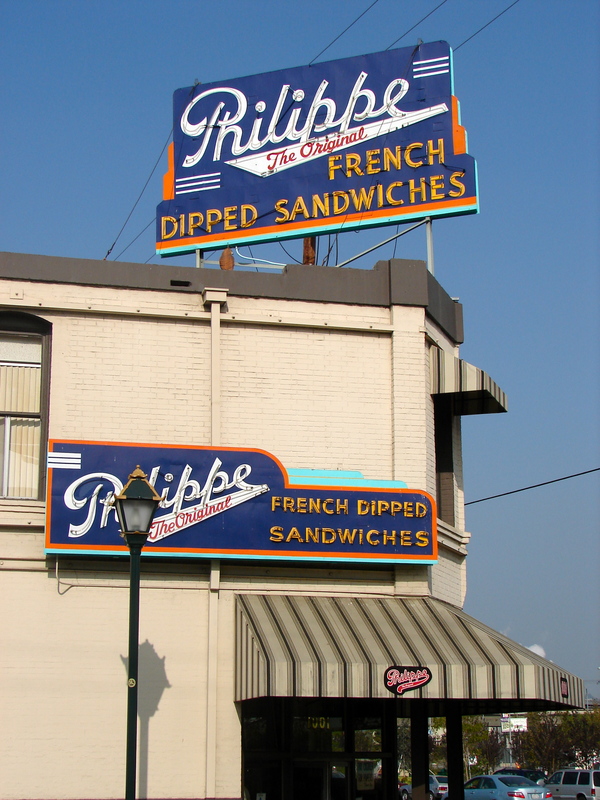 So the story goes, Philippe The Original is the place where the French Dipped Sandwich was invented, although there is a dispute about that with another downtown Los Angeles eatery (more on that later). The restaurant was established in 1908 by Philippe Mathieu, but in 1918 destiny changed the restaurant’s fortunes forever. Supposedly Mathieu was making a sandwich when he accidentally dropped the sliced french roll into the roasting pan that was still full of the hot juices from the oven. The restaurant customer, a policeman, said he would take the sandwich as is, and he enjoyed it so much that the next day he brought some friends back to the restaurant and asked for more of “the dipped sandwiches.” A legend was born. Today, after 106 years (it had to move it’s location in 1951 to make way for a freeway), Philippe’s is still as popular as ever, and the French Dip Sandwich is, of course, its signature dish. It still has the original furnishings from the wooden stools to the sawdust on the floors to a hand-painted menu board to the long communal tables. I used to come here all the time as a kid with my dad before we would go to Dodger games. 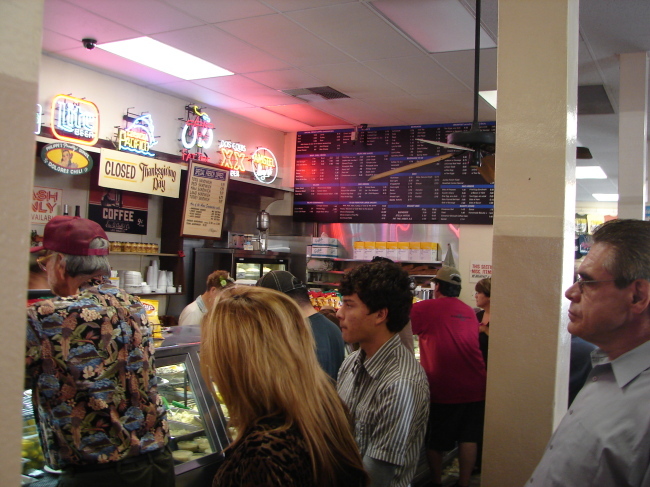 If you get to Philippe’s around lunch time, it can be incredibly crowded. Walking in, you will see a very long counter with ten separate lines of customers waiting patiently (most of them anyway, this is L.A.). This was Dan’s first time to visit. 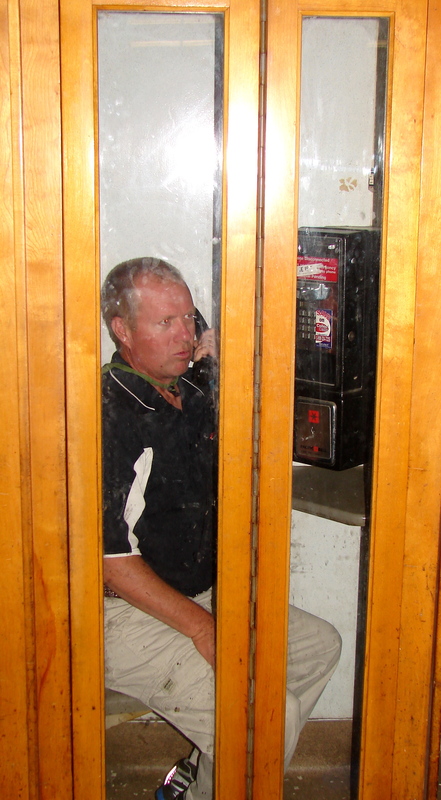 When you finally reach the counter, one of the “Carvers” will take your order. I love the Original beef French Dip smothered with homemade hot French mustard. 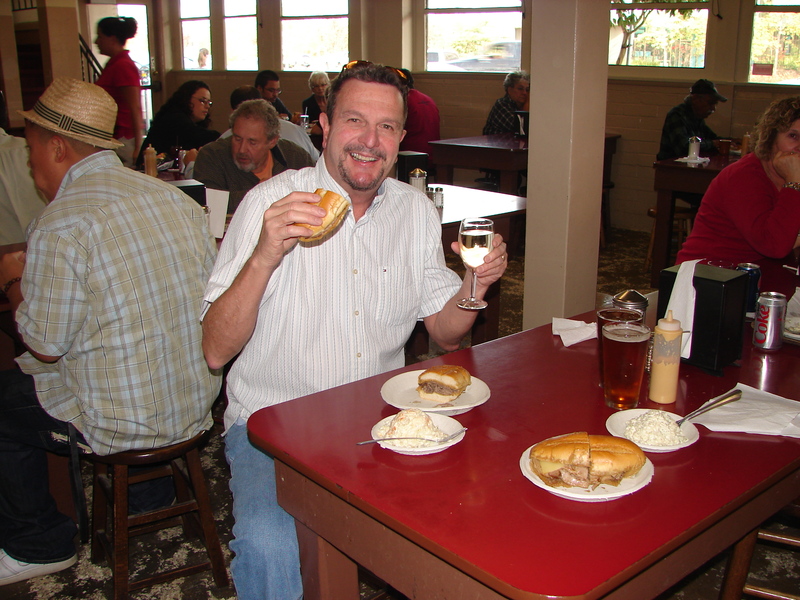 Tracy is partial to the Turkey dipped sandwiches when I meet her here for lunch on occasion. 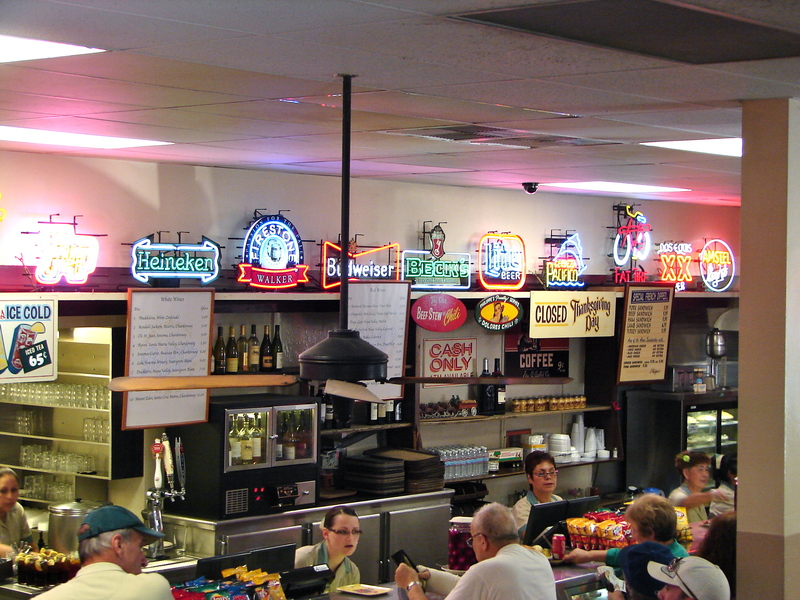 There are a number of side dish selections available plus decent wine and beer selections. Interestingly, the Carver will not touch your money. Customers instead put the cash (and this place is cash only) on a tray, and the Carver then takes it to the cashier. The Carver then returns with your change on the tray. This was done for sanitation reasons back in the early 20th century, and the tradition continues 100+ years later. Need a cup of Joe? Philippe’s is the place for the best caffeine bargain on the planet. A cup of coffee cost a nickel here from 1908 to 1977. Due to that darned inflation, it was raised to a dime in 1977, and in 2012 the price was raised again…to a whopping 45 cents. Dessert here is very good, too. I’m partial to the cheesecake and the apple pie. 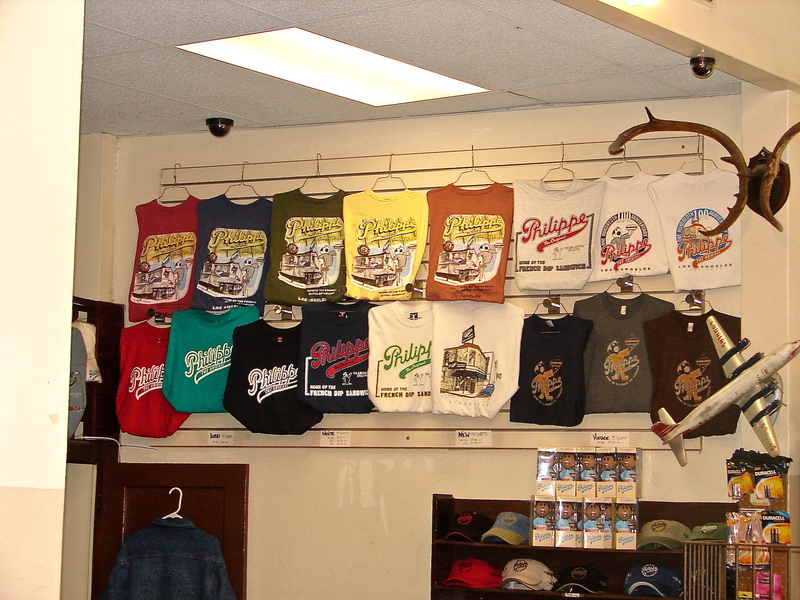 You can even buy a t-shirt. 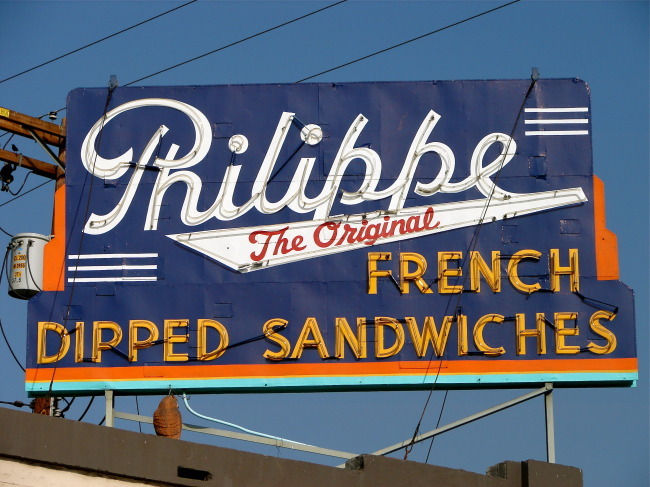 If you journey to Los Angeles, Philippe’s is a landmark well worth visiting. It’s located very near Union Station on the corner of Alameda and Ord. It’s open every day of the year, except for Thanksgiving and Christmas. When I worked in downtown Los Angeles in the early 1980s I was a Cole’s regular, but have not dined there since 1984. 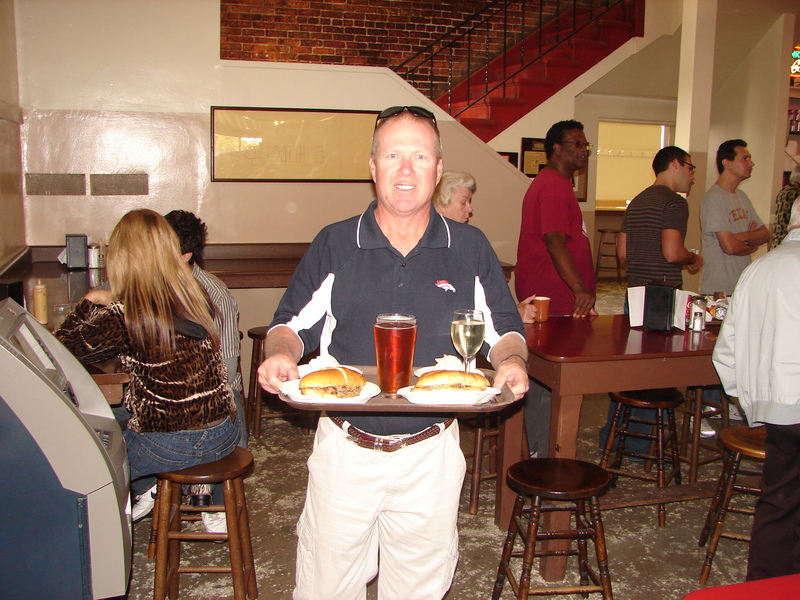 Luckily, Dan is refereeing another game in Los Angeles soon, and we are going to make a mid-afternoon trek to Cole’s in an effort to determine who has the best French Dip sandwich, Philippe’s or Cole’s. Stay tuned!